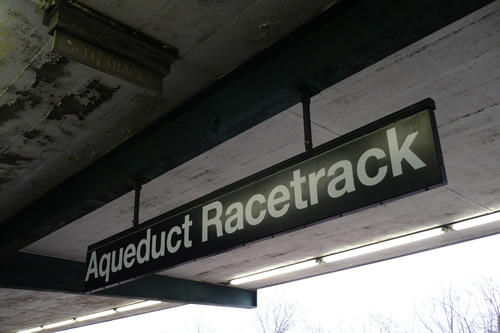 … for the crumbling, charmless Aqueduct Racetrack subway stop, set to close on Saturday in advance of renovation for anticipated casino patrons. The old station won’t be missed, but I get a real pang looking at pictures of the demolished outdoor grandstand seating and thinking about the loss of the unobstructed view afforded by the third floor seats overlooking the finish line. The field for the 2010 Wood heading into the clubhouse turn. 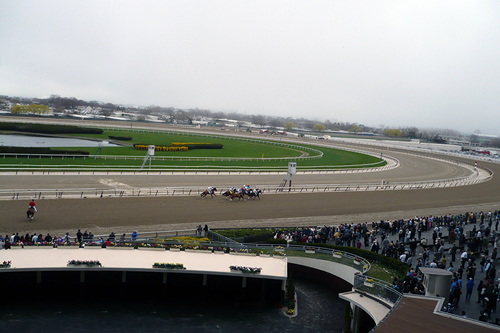 4/8/11 Addendum: Week-by-week photos of the construction work at Aqueduct by Brooklyn Backstretch. Stunning, how much demolition is involved.